HIGHLAND PARK – One of the main draws of the North Shore is its proximity to Chicago and all that it provides: hipster restaurants, buzzy cafés, chic boutiques and cool neighborhoods worthy of an Instagram post. 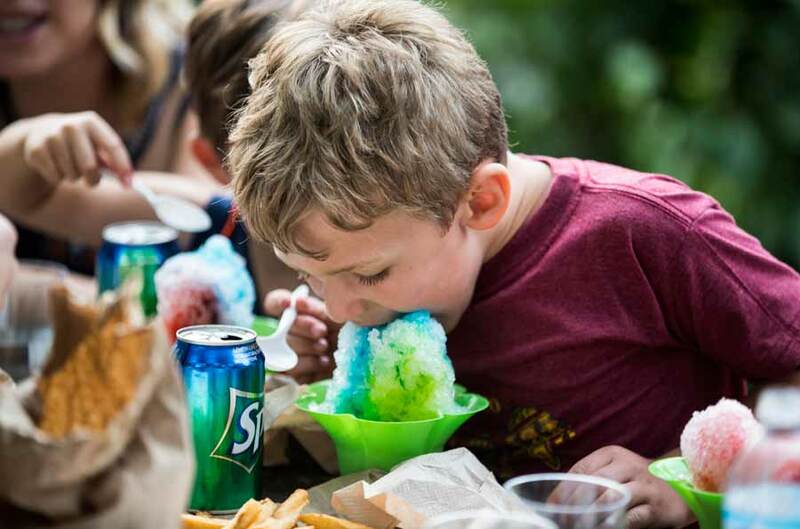 Turns out you don’t need to commute to the city to take advantage of one of summer’s hottest events: Food Truck Thursdays in the Ravinia District. 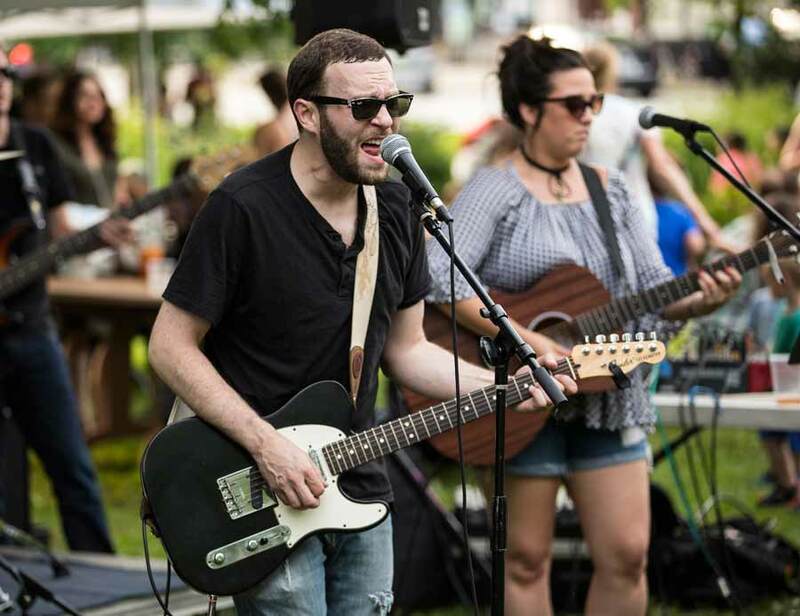 Located in what’s usually a quiet side street next to Jens Jensen Park in Highland Park, Food Truck Thursdays includes more than a dozen food trucks from some of Chicago’s trendiest eateries every Thursday during the summer. How trendy are we talking? A good rule of thumb is if a restaurant has a food truck, it’s probably run-of-the-mill trendy. But if an eatery doesn’t have a brick-and-mortar restaurant at all, if it’s just the food truck, then it’s definitely cool enough for college kids. The trucks line Dean Avenue alongside Jens Jensen Park and serve up everything from lobster mac ‘n’ cheese to sushi burritos – it doesn’t get any trendier than a sushi burrito. For those whose idea of food worth leaving the house for is not quite so exotic, never fear. There are food options for all levels of hipster—on a scale from your aging, born-and-raised-in-Idaho neighbor to your son’s new girlfriend from New York City, most of the trucks are like the mom who brings great snacks to soccer games and occasionally still gets carded. Cool, but approachable. There aren’t too many places to go for great food, live music, and a place to let the kids – and dogs – run wild. But Food Truck Thursdays delivers on those three points and plenty more. Need to disentangle your toddler from her tablet? She’ll love the fresh mini donuts at the Beaver Coffee truck. Haven’t seen your teenager in days and are unsure if he’s even still in the house? He’ll poke his head out for some tacos from Rio Bamba. College kid just returned from studying abroad in Europe and is now an insufferable food snob because “nothing’s as good as that little sandwich shop in Paris”? Introduce her to Mexican grilled corn at Mother’s Truckn Good or a Vietnamese pork banh mi at Chicago Lunchbox. Unsurprisingly, Ravinia Food Truck Thursdays is insanely popular. 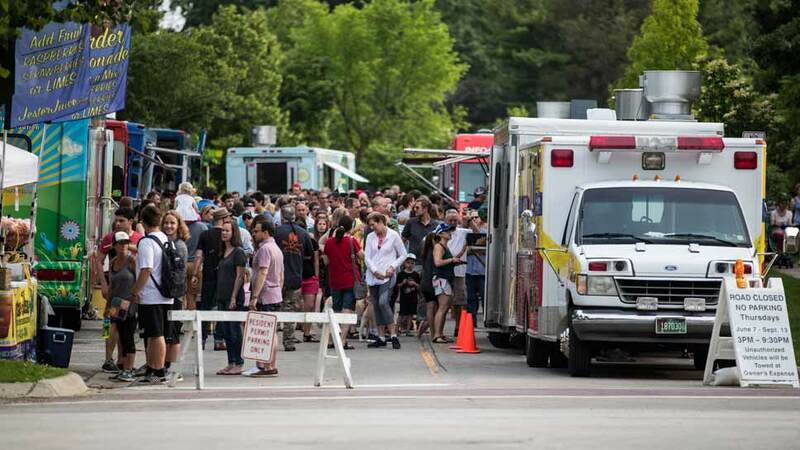 So much so that organizers brought the event back for a second summer with even more appearances from some of Chicago’s most sought-after meal trucks. Luckily, the trucks cook and serve speedily, which means that lines don’t get out of hand. The trucks are scheduled to serve from 4:30 p.m. until dusk, but some have had to close early because they ran out of food. Since food truck licenses decree that alcohol cannot be served from a motor vehicle, none of the dozen trucks dispense anything stronger than fresh-squeezed lemonade. Fortunately for those interested in a cocktail, local restaurants Abigail’s and Ravinia Brewing Company set up bar stalls inside Jens Jensen Park. Simply pick up your food on the street and step into the park, where you can buy beer, wine and cocktails as you attempt to snag a picnic table. The park is just as busy as the neighboring street, with tables from local businesses and a stage with live music. 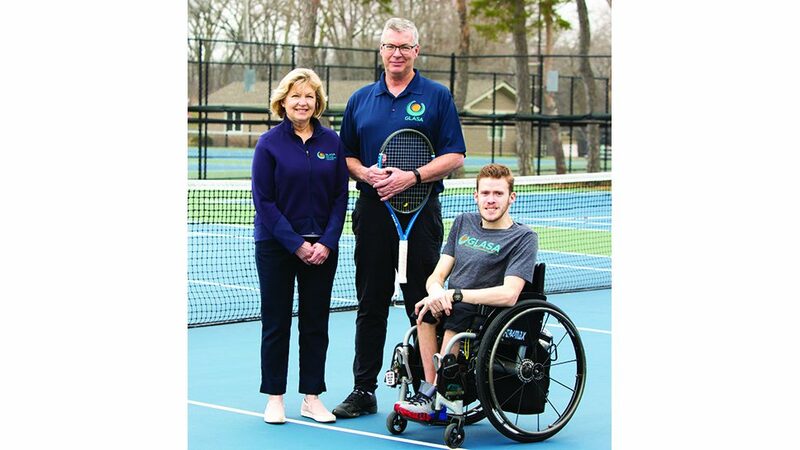 Plenty of free parking is available in the Ravinia Metra station lots and on nearby streets, but you may have to walk a bit due to the popularity of the event. The calories you burn walking will justify all the food you’ll eat, anyway. 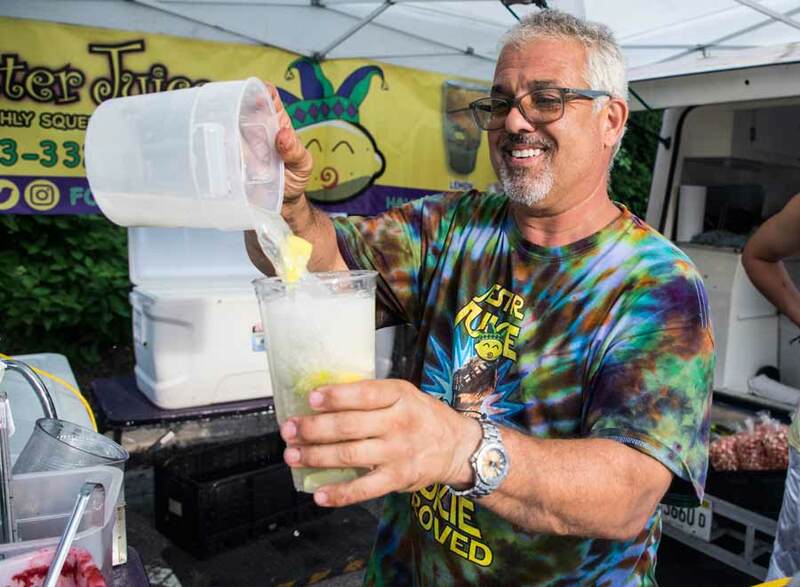 Highland Park resident Ross Kessler, owner of Jester Juice and Popcorn Jester, pours a lemonade. 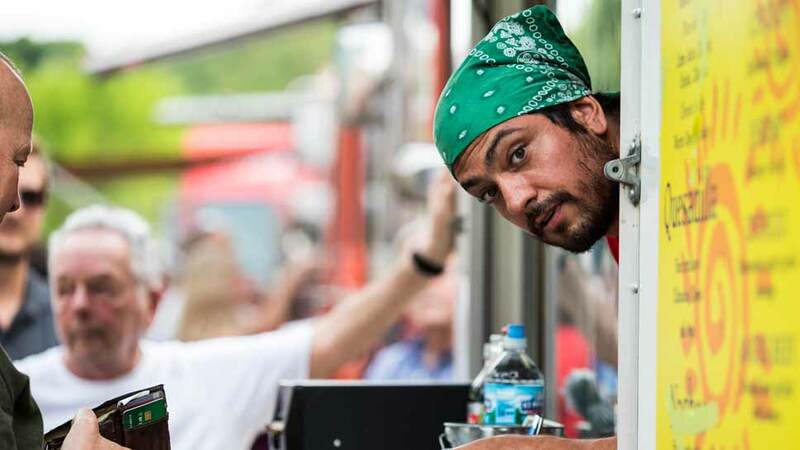 Tony Andino, co owner of Riobamba Latin Kitchen in Glenview, takes an order at Food Truck Thursdays. Ravinia Food Truck Thursday runs every Thursday until September from 4:30 p.m.-dusk at Jens Jensen Park: 486 Roger Williams Avenue, Highland Park.